London-based HFMC Wealth helped raise more than £60,000 for two charities after sponsoring a money-can’t-buy track day. Veloce 2018 was held at Goodwood Motor Circuit and drew in 70 attendees. 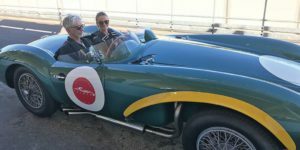 They were driven, or should we say thrown, around the track by a host of former racing drivers, including former Formula 1 world champion Damon Hill (pictured) and Le Mans winner Andy Wallace.